Lee Sheldon wants to build a holodeck with contemporary technology. If you've watched some of the later Star Trek series, you're probably familiar with the holodeck, a virtual reality room capable of simulating any situation programmed into it with lifelike fidelity. In the show's mythos, the holodeck could do everything from helping Captain Picard fight the Borg as a 1940s detective to impregnating a male chief engineer. The educational and entertainment potentials of such a device are limitless, but the technology just doesn't exist yet - unless you listen to Lee Sheldon, a writer and producer for Star Trek: The Next Generation. Sheldon believes that he can build a reasonable approximation of the holodeck using modern day technology, and has already taken the first steps towards doing so. Creating an entire world out of thin air seems like an impossibility for anyone outside of the 24th century, but Sheldon argues that humanity has already developed most of the disparate elements necessary. "You have 360 panoramic screens, 3D stereoscopic projection, surround sound, motion tracking interfaces that include everything from Kinect at the low end, intelligent virtual agents, omni-directional treadmill floors, compliant surfaces, adjustable air flow, temperature gradients, and Smell-O-Vision," Sheldon explains. "Why can't we bring back Smell-O-Vision?" Combining a multitude of different systems is not quite as elegant as one single computer projection that stimulates all five senses, but Sheldon points out that the holodeck was not just a tech showcase; it was also a highly sophisticated form of play. 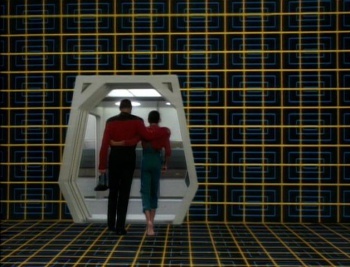 "The holodeck was not about the technology, but the narrative immersion. "As a result, Sheldon suggests that experienced game designers will be crucial in creating believable, immersive scenarios. Sheldon's holodeck is still a long way off, but he has already taken his theory for a test run. His Emergent Reality Lab took a classroom full of students just learning Mandarin Chinese and attempted to teach them a semester's worth of material in eight weeks. Part of the learning experience involved students roleplaying being lost in a Beijing airport, complete with costumed actors, sets, and a huge Kinect-controlled screen simulating the airport's environments and facilities. According to Sheldon, the class ran through the preconceived scenario in a fraction of the time expected, and spent the rest of the lesson in a form of "emergent play." Sheldon's trial is closer to theatrical improvisation - or even LARPing - than a real holodeck, but the inclusion of immersive technology and free-flowing narrative is a promising start. "Your players are smarter than you," he warns. "They'll figure things out faster than you, like the emergent play in our airport ... We cannot tell stories in the same way to make this thing work; in fact we have to give up some authorial control." The Emergent Reality Lab is in the process of conducting a more elaborate trial, so you, too, may be able to fight androids in the Old West sooner than you think.